This is where Annabel Trends' wonderful Spatrends Microfibre products enter our busy lives. Clever microfibres take the hassle out of the time-consuming practice of painting your nails or removing your makeup after a late night, and are also super-absorbent and soft. One of the most frustrating things about applying a facial or washing makeup from your face is, most often, your hair. If your locks are getting in your way and sticking together with facial product, then Spatrend’s microfibre headband will certainly come in handy. A Velcro closure means that it is comfortable, and like all other products in the Microfibre range, it is super absorbent and dries fast. 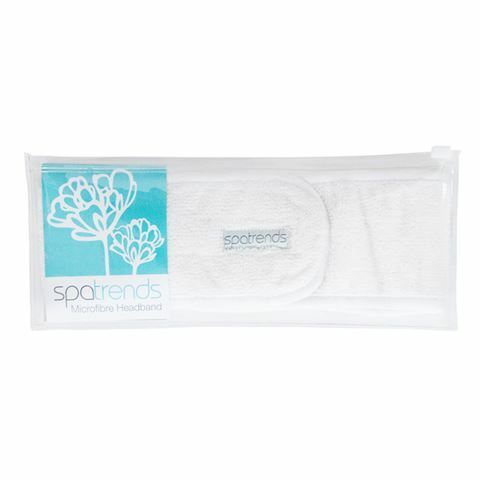 Bring the luxurious feeling of the Spatrends mircofibre range in to your home, and pamper yourself again and again! Made from a blend of polyester and polymide. Super absorbent and quick drying.